Discussion in 'Cake Wars' started by Necco, Mar 1, 2019. Do you agree that Frosting either the unfun or overpowered? Yes I agree that it is overpowerd. No I do not think it is unfun, nor is it overpowered. Frosting kit is incredibly overpowered, it gives you a pvp advantage in the early-game, mid-game, end-game. There is nothing you can do pvp wise against a good frosting player other than back off. The knockback you deal with a snowball is an instant combo starter and unless the knockback from snowballs is removed it will always be an overpowered kit. Obtener mejor equipo? 2v1 ellos? Hay muchas formas de matar a alguien que tiene Frosting. No hablo español, solo uso el traductor de Google. ¿Cómo se habla el taco de habla española? Frosting is an achievement kit and even though it may give an advantage to the user, nothing should be changed about it. Those who put time into Mineplex and complete all 16 Cake Wars achievements deserve an advantage. cerns and Jaekub like this. Okay, so I'm going to comment on this for like another time. This caused a lot lot lot of discussion. Dan made a poll in the Mineplex Discord about it but I feel it got so much negativity because it was too vague about what the change would be. Some people thought they meant remove slowness entirely or something and, fearing for their achievement kit getting super nerfed, press the x button instantly. Later that month in GI, we were still discussing it so Voca made a GI poll that, as you've seen multiple times in this thread, got a pretty huge majority of votes for implementing my change into the game (the 2.5 > 2). The only people who don't want the change to happen are the super tryhards who are Frosting-dependent and, if nerfed, would start losing. Thus, the argument still happens day-to-day. In the end, though, it's obvious that the kit is overpowered and needs to be nerfed. Not everyone is super good and not everyone is able to maneuver they're way out of the kit. There are new players that need to be retained so the game as a whole can actually grow instead of new players being pushed and pulled by experienced players who have a significant advantage: the Frosting Kit. And if we're being completely honest, the 2.5 to 2 second nerf really isn't a big nerf. the Frosting-dependent players will still be at large and it'll still be a problem, but it's a step forward to balancing the kit. That's the document the project manager looks at and implements pretty much all the changes so next CW update I'd confidently say there's going to be a nerf. First, it doesn't need to have a higher skill level to play- it's not a good thing to make a kit less user friendly. Second, no, it's not quite as simple as just clicking in someone's direction- if you ever come up against a half-decent player you will realize that it's not that hard for the snowballs to be dodged or even comboed out of. Easier said than done. It's very hard to actually hit a player first with frosting because the snowballs travel distance? Farther distance then your sword can travel to the hit person first. Unless, you want players to completely modify their strategies and go through the trouble of like trying to backstab/sneak up on them there's no way it's counterable. Kits shouldn't cause this much upset in games. Maybe it's just my superiority complex kicking in again, but 95% of the time, it's super easy to avoid getting suffocated by someone using Builder. Archer is generally a non-issue. I don't personally think any of these kits should be in the game, but I run into far more issues with people who are using frosting as a crutch than I do with people using any other kit. Arguments revolving around Warrior are somewhat useless, considering the kit requires you to kill someone for it to be of any use whatsoever. Sorry, but your reasoning is literally "other kits are worse or just as bad, so there." Or at least, that's what your point would be, had you not said, "is less unfun," which would imply that builder suffocation and archer crossmaps are actually more fun than frosting. Builder suffocation really isn't an issue anymore after we nerfed the suffocation damage. I don't get suffocated anymore since the update. Archer kit, after its nerf, is pretty underpowered. But I like it that way, no. one. wants. bowspam. and let's please not do anything that might cause that. Yeah, but not an advantage of this caliber. A 2 second slowness on the snowballs is still quite a big advantage. I don't know what else to say besides it's just not that hard. Sure, backstabbing could be a good way to go if you really can't pvp, but literally just strafe. You can also consider going in with a teamate, using a bow, placing blocks and/or platform trapping, as well as buying better gear. Or like I mentioned previously, you could strafe/dodge. In fact, just do anything besides charging straight at the user and the kit becomes manageable. There is a legitimate argument to be made that the kit is slightly op, which is why I'm honestly fine with the slowness time nerf. However, the kit is relatively easy to counter as is, and it's just not as good as people seem to think. -Strafing doesn't work on 1 wide bridges, and even on 3 wide you have to be very mindful of what you're doing. -Anyone who isn't bad at Minecraft shouldn't have difficulties hitting you with a snowball at close range, or just throwing another, as this isn't a case of "they only have one so you can bait it out and then go in" like Ice Prison in Champions. "Dodge it" isn't really a solution when you're fighting someone who is above a certain level, even if you are also fairly decent at clicking on block people yourself. -Any solution involving a teammate is a nonstarter imo, you shouldn't have to commit two people to kill one person. Team game doesn't mean that some kits should require the team to gang up on them. PapiKirito and Acerna like this. -Same argument could be made against archer on bridges- just don't engage on those areas or play around it by building. - Fair, but you can still hit out of frosting and/or block place to stop their momentum. It's still a winnable fight. -These solutions involving teamates aren't meant to mean they are the only way to counter frosting; I just mentioned them because a lot of the people I see complain about frosting may not be capable enough in PvP to strafe, block-place, etc. You don't have to gank a frosting to kill them, but if you are having trouble, a teammate is always a big help. I think this is the 10th thread I've seen regarding Frosting, and all of them have been locked. -Archer can be blocked up on and is a longer range weapon. I'd also argue that you can obtain a bow yourself and shoot them back, and Archer kit isn't particularly useful late game as buying bows and arrows and the like isn't much of an obstacle then. You can't get snowballs yourself, even late game. -I mean, that's technically true for any combo starter right? That's kinda like saying that you can still win against someone who has a fishing rod when you don't in BuildUHC by placing blocks and breaking the combos they inevitably get from the rod. It's possible, just disproportionately difficult. That also doesn't fix the fact that you have someone with frosting kit who still isn't dead, it's just that you're down hearts instead of dead in that case. Telling people to 2v1 to counter is a false philosophy, that extra player you are using to fight a single player because of an overpowered kit could be of benefit somewhere else, such as capturing a point, defending, or attacking a cake/team. The reason you are able to jitter click to counter certain frostings is because they are bad frostings who use the kit insufficiently, those with even mediocre timing are able to get easy combos, they can also stop any combo by spamming snow, and likely able to counter combo due to the slowness and knock back. Just cause you can fight a frosting doesn't mean the kit isn't overpowered, if you look at the player base of mineplex, there aren't many competent players likely to be in your lobby of 16. Even if there are frostings, most of them got carried for the achievement, so it should be relatively easy to beat them, which you claim. But that doesn't mean that it isn't overpowered, because trust me, competent players who know how to use frosting will prove to you that it is overpowered. I don't even play CW, I take on try hard teams solo because I stack up and use frosting, even when my cake is taken out early cause CW sweats love to target and cake snipe. Look at it this way, frosting is always a benefit or neutral in a 1v1, there is no punishment to missing each of your snowballs in combat, and they even regenerate very quickly, so if you miss them all at the start its likely you can use it in the middle of the fight to get a combo. So when it comes to a 1v1, a frosting will always have an advantage, never a deficit. You can claim that you can out stack them, but they have the same opportunity to get just as stacked, or even more stacked due to its strengths in capturing points for resources. 1v1's 2v2's equal fights and pvp is the basis of the game, combat is an essential aspect, which frosting is far superior in. Claiming out strategizing or outsmarting them is a counter is a logical fallacy, as you assume that they either can't do the same, or are just incompetent bots. Without a doubt frosting is a major combat advantage, far superior especially in 1v1's. Making it an advantage in the most important aspect of the game. 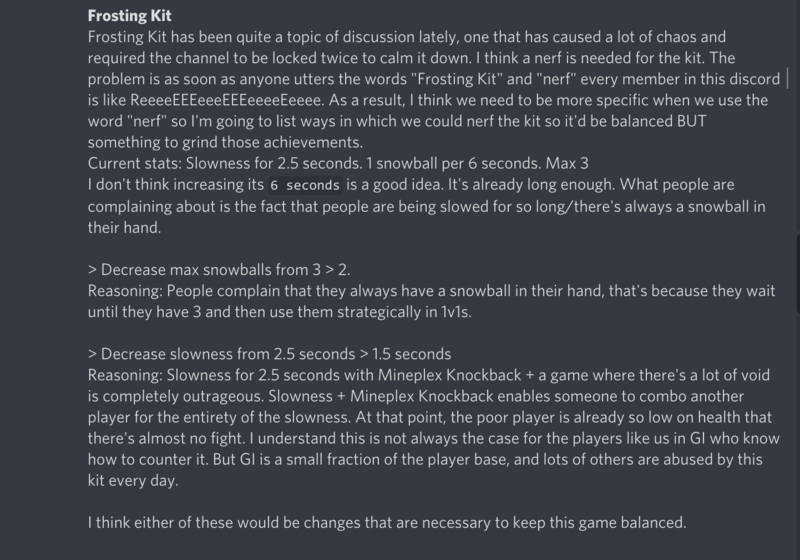 No kit has a benefit in melee 1v1 pvp besides frosting, brawler regenerates after, but that doesn't do anything if you lose, builder is a good kit, but you unfortunately cant suffo people on a point, you can counter an archer by placing blocks, arrows are easier to dodge than snowballs. So yeah frostings can just sit at a point and keep it captured for their team, and its a pretty big area so plenty of room to use snow utilize proper spacing. People claiming that builder is better or OP cuz of suffo don't know how spacing works, and how its literally the easiest thing to counter, and also probably haven't played -snip- bridges, cause with that skillset builder really isn't hard to counter. If you are able to hit even one snowball, they will be slowed for more than a sufficient amount of time. To capitalize this, you are now able to use even one remaining snowball as a rod, since they are slowed, they wont be able to dodge it, and using another snowball refreshes the slowness time, meanwhile giving the perfect knock back for a combo. Since they are slowed, they wont really be able to turn around to avoid the combo, you'll still get at least 3 hits, but likely 4 or 5. Plus when they try to turn around to counter combo, u can legit just snow again, or at least settle for a trade, if you fall for a turn around combo with every advantage given, its not that frosting isn't op, its just that you aren't as competent in pvp. Or if they try to kite u can just slow them to get the final hits. Yeah read what I said earlier please, achievement kits shouldn't be an advantage for numerous reasons, preferably something fun, creative, unique, but also suitable for FAIR gameplay. I think an easy solution to this is just to lower the time you have slowness, orrr something. PapiKirito and Jaekub like this. I prefer heat and warmer seasons. The cold is not my thing.